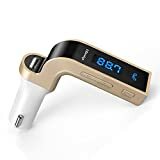 The Nulaxy Wireless In-Car is our pick for the best FM transmitter, which has a 5V-2.1A charging port that can allow you to charge your mobile phone or anything that is USB capable. The noise and the interference and car ground loop noise is very minimal and small so it will not disrupt your listening pleasure at all. Our step-up pick is the Sumind Upgraded Version and it has an easy to use charging function and a clear LCD backlight display that measures 1.7 inches. Moreover, it can show your car's battery level so that you don’t feel worried about its power consumption. It uses Bluetooth of a higher version and has an EDR or Enhanced Data Rate feature. 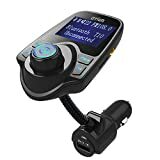 The budget pick is the AMIR Criacr Bluetooth and it is equipped with audio enhancing tools like cancellation and noise suppression for making sure that you only listen to pure music with minimal noise background. It has an output of 5V-2100MA for the charging ports (2 USB ports) and it can support various file types, from mp3, to FLAC, WAV, WMA and the like. 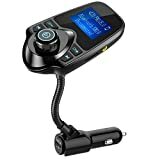 An FM transmitter is a kind of device that is used to have a signal of radio anytime and anywhere. 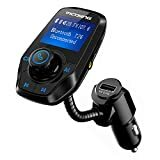 The ideas of this radio transmitting device is to transfer your music player's signal onto your car radio, in which you just have to turn to the right frequency depending on the model that you have, in order to get the output sound. 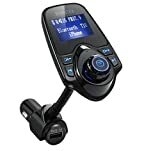 This device is needed if you cannot get your music player to connect to your car stereo. This kind of radio transmitting device can be attached onto or plugged onto the cigarette lighter of a car, while others work wirelessly or with the use of Bluetooth to work. A radio transmitting device can connect in many ways, and it is usually the last resort when it comes down to connecting your music player to your car stereo radio device. 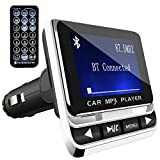 It can also come in primitive forms like a cassette tape, if your car stereo is REALLY old, let's say from a 2000s model, and has no means of Bluetooth connection or any wireless connection at all. However, this is a very rare case, and can only be found on units or car stereos that are very old, and are in need of a personal radio transmitting device of such design. Simply put, if your car stereo does not have an AUX port, this personal radio transmitting device can be used. The typical range of connection for any personal radio transmitting device is from 100 to 300 feet, which is not too powerful because it is only intended for personal use. This translates to a frequency of only 87.5 to 108.0 MHz, which is typical for most radio stations anyway. This personal radio transmitting device can be portable and very easy to use, and is also usually pocket size so you can travel with it. This kind of radio transmitting device is also available in most car accessory stores out there. They can vary in price but less branded ones tend to be cheaper. Some that may come with Bluetooth technology may be a little pricier but they are one of the most popular nowadays due to the very fact that many vehicles already have Bluetooth technology embedded onto their system. You have to consider the fact that radio transmitting devices can all vary in frequency depending on who manufactured the radio transmitting device. You will have to find out in the user's manual and see which frequency should you turn your car stereo radio onto. It is often a trial and error process if your car stereo radio has a manual tuner and not a digital one. Way of connection: most personal radio transmitting devices today have a connection capability for USB ports, Bluetooth, cigarette lighter connection and many more. Some even have dual USB ports if you want to connect with them in this way. Most of them even have app support and may also connect with your own car locator. Display: the display option for the personal radio transmitting device should be clear, concise and easy to navigate through. The brightness setting should be easy to set when you are driving so that you can clearly see what is on the menu regardless if it is day time or night time. The text and the numbers should all be clear and concise in terms of setting it up. Ease of connection: you also have to consider that the personal radio transmitting device is easy to connect to your car stereo or stereo radio device. It should be simple and straightforward with its settings, menu and connectivity, so that you will not run into any kind of problem later on. Included accessories: some of these personal radio transmitting devices have accessories such as wires and the like. 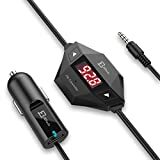 These accessories can help with establishing a better connection for your personal radio transmitting device to your car stereo or radio device. As our top pick, the Nulaxy Wireless In-Car has very minimal noise and interference due to the advanced interference and noise cancellation technology. You can connect various device types like the iPhone, iPad and many more phones and music players out there. It utilizes easy to connect 3.5mm audio jacks for ease of music connection. There is also a 5V-2.1A charging port for your phone or device that is USB powered to be charged on the go. It can also support Micro SD cards with the file format of FAT and can support up to 32 GB of Micro SD card size. It also recognizes input and output from the AUX port, can support both mp3 and WMA formats and is also A2DP capable and ready. Simply put, this device works with any audio file that plays on your device or phone. All you need to do is to tune the radio to a vacant frequency from 87.5 to 108.0 MHz and you will be able to find the frequency in which the device is playing your music from. The only flaw but not a deal breaker with the Nulaxy Wireless In-Car is that setting the language can be difficult at first, but if you find instructions from the site and the user's manual, you'll be able to configure it easily. The Sumind Upgraded Version is our step-up pick, which has an easy to use 270-degree gooseneck feature for simplicity of rotation in any sitting position whatsoever. All Bluetooth compatible devices can be used with this kind of audio radio device and it also has compliance with Bluetooth v4.2 and EDR technology as well, so it is easy to use with many newer technology phones and music playing devices. You won’t have problems with viewing due to the 1.7-inch LCD backlight. Additionally, you can also play songs from a micro SD card in FAT format and you can also make calls or receive calls to someone due to the hands-free talking mode that can reduce interference, noise and wind when you call. Expect a faster data transmission rate due to the EDR while a stable Bluetooth connection ensures music playing on the go without much pauses. Moreover, AUX output and input can also be supported by this device. As our budget pick, the AMIR Criacr Bluetooth is versatile with file formats, from mp3, to WAV, to WMA and even FLAC. Because it supports FLAC, it can allow you to listen to lossless music in your car stereo. Noise and wind suppressed by CVC makes it very quality in terms of playback properties, and the A2DP function, which is available in most phones, can be supported by this device. A total of 2 USB ports, both bearing outputs of 5V-2100MA, can be used to charge your phone. It can get your phone fully charged easily while you are driving or riding your vehicle. 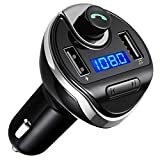 The cigarette lighter connection makes it simple so it is suitable even for older 2000s model cars and vehicles out there that do not have AUX or Bluetooth features. It also makes the job easier for you due to the memory function and ease of auto-searching. The AVANTEK Bluetooth FM comes with hands-free technology which can make it easier for you to drive and then take calls or listen to your favorite tunes. The button can be held for 5 seconds to reject an incoming call, which makes the process of call handling super easy. What’s more, you can expect superb audio quality because of the 3.5mm audio adapter and the internal design of the circuits of this device. There is also a Micro SD card slot for those who want to play songs from their card. It supports a majority of common formats of audio, such as MP3, WMA, WAV, and FLAC (high quality lossless audio files). You can also clearly make out the letters and numbers from the 1.44 inch LCD screen so reading it while driving is less of a hassle. In addition, charging of your devices is super easy due to the included USB port. For cars that do have an AUX input and output system, the VicTsing Upgraded Bluetooth can be a great choice for you. It also has an easy to read 1.44-in LCD display screen. You don’t have to worry about setting it up because the device will automatically connect to its last paired device to avoid hassle due to its memory function. It has a microphone in the device so it lets you handle your calls smartly – you can redial, answer, hang up, reject a call and do other things with it. A 3.5 mm cable is provided for most smartphones and devices and it will work well for both Apple and Android devices, plus many other kinds of Bluetooth ready devices out there. Additionally, the flexible goose neck makes adjustments on the fly super easy to handle while you are driving. With the ToHayie Bluetooth Wireless, you can easily control the whole thing with the included remote control for ease of access. There is an LED screen can display at 1.4 inches so it is easy to see all of the menu items and the currently playing tracks from your phone, as well as configuring the settings. There is a USB 5V-1.1A charging port for your phone or any other device, such as a power bank. Like most devices, this one supports MP3/WMA formats and others. It has the capability to help you control music playing or calls freely with great ease. The screen is so versatile that you can also see the phone number for incoming calls from your phone and you can also hang up or receive the call while at it. This is a great choice for those who drive but need to handle calling. If you want a device with various color choices to complement your car interior, the LDesign Wireless In-Car can be a great solution for you. It has a 3.5 mm aux cable for audio devices and has a USB port and a micro SD port for music media. You don’t have to use your hands a lot during answering the calls that are made to your phone, making it a hands-free device. It is a simple and straightforward way to transmit your wireless audio to your existing car stereo or radio. It supports both A2DP and Bluetooth technologies for better quality sounds. It also uses the Cancellation and Noise Suppression (CVC) to reduce the noise and interference to make sure that the quality sounds are achieved whether you are making a call or just listening to music in general. If you want a simpler and more minimalistic design, the JETech Wireless Kit may be a good choice for you. It can work well with GPS and other devices and it has a USB port to be able to charge your various devices. It can be connected to your audio device using the 3.5mm jack and it is easy to operate without much hassle. It is compatible with most Android and Apple devices out there. Unlike other transmitting devices for radio out there, this one clearly provides CD quality sound out of your radio. Another awesome thing is that if you are subscribed to Pandora, Sirius XM or Spotify with no ads, you can easily beam it up to your low technology car radio. This is applicable to those who cannot go for a stereo receiver that is too pricey or if the car model is too old for a quality receiver. The Otium Bluetooth Wireless comes with a USB charger port so that you can be allowed to charge various devices, from phones to power banks, in no time while you are on the road or stuck in the middle of traffic. Everything in the device can be clearly seen due to the 1.44 inch LED screen display. Like most devices, you just need to scan through a frequency range from 87.5 to 108 Mhz. This is also capable of reading TF or micro SD cards and is A2DP ready. The function that enables you to do hands-free calling makes the job easier for people who are on the go and want to take calls for business purposes. It also has a full duplex communication feature plus CVC for easy noise cancelling when you are taking or making calls. The charging speed is also pretty good due to the 5 volts of power or 2.1 amperes. The Roav by Anker is a unique innovation that uses Bluetooth 4.2 technology and is also a car locator device. Various car models can be compatible with this kind of device and it also has a USB car charger for you to easily charge any kind of USB powered device (2 slots). What’s more, any car stereo to make and receive phone calls due to the Bluetooth technology. If you are prone to forgetting where you parked, this can be a solution to your problems. It has an AUX output plus a fast charging technology. You can pair it with the app to help find your car easily, especially in a high traffic area. You can also expect crystal-clear calls due to the unique hands-free technology that enhances your voice when you talk. You can also easily broadcast whatever you are playing on your phone to your car stereo in no time. The app also has a battery monitor so that you can know when your car battery is getting drained on its power and when you have to recharge it. There were others that did not make it to our list because these personal radio transmitting devices were not too durable and were also too complicated to set up. It is important for any personal radio transmitting device to be simple and straightforward when it comes down to its features and ease of access and setup. Q: What are the benefits of a car radio system? Car radio systems can help you during times of boredom or exhaustion, such as in heavy traffic volumes where your car or vehicle cannot advance further in a fast way, so you can listen to tunes. Hands-free calling, texting and operation of your stereo unit is legal in many countries, as an alternative to texting or calling with the use of your cell phone. Most of them have USB ports that allow you to instantly charge certain devices at hand. Q: What are the differences between AM and frequency modulation radio? frequency modulation means Frequency Modulation. In the middle of the 1870s. Made by Edwin Armstrong in the 1930s. AM radio typically uses poor sound quality and thus, less people use it for music and more for talking and broadcasting or news. frequency modulation radio has better sound quality and thus, it is mostly meant for music and similar audio or music. The frequency range of AM radio is from 535 to 1705 KHz. The frequency range of frequency modulation radio is from 88 to 108 MHz. AM radio can only go for as high as 1200 bits per second. frequency modulation radio can go as high as 1200 to 2400 bits per second. AM radio has a bandwidth of 15kHz, with 30kHz for the amplitude-modulated signal. frequency modulation radio has 180 kHz for the required bandwidth with the modulating signal frequency of 15 kHz and 75 kHz of frequency deviation. AM has more noise because of the amplitude problems. frequency modulation has less likelihood of getting noise due to frequency variation. AM radio is typically used for talk shows, broadcast interviews, news reports, storm warnings, weather reports, police reports, traffic advisories and the like, which uses minimal music and more of vocals. frequency modulation radio is mostly meant for music, such as songs, requests and even live performances from bands, artists or singers from the radio station itself. Q: What are the different spectrums of waves that can be classified with various broadcasting air media? Q: What are the different kinds of waves that are used for radio? This is the main source of your music or audio or music, and is in no way modulated yet for broadcasting. This waveform can change depending on whether it is used for AM or frequency modulation radio. This one, as you can see, has a little bit of alteration to the audio or music due to the change in amplitude, which also deteriorates the quality of background music, making it only ideal for vocals or talking. This one, as you can see, is also altered but only with the frequency so you can see that it is still a straight wave as compared to the AM wave, making it ideal for music and audio or music. Q: What radio frequencies do different country use? Q: What can you do if your car stereo does not have an AUX port? For those who have cars that are in the 90s or 2000s, you might have absolutely no way to get your music to be played other than a cassette tape slot. There are still a couple of adapters that you can use, which has an AUX adapter at the end of the cassette tape. If your grandpa’s old 2000 model car has this kind of car stereo, you’ll know what to do. Getting a head unit is only recommended if your car is not that old yet, or if it is still far away from getting into the dumpster. Head units can be costly, and securing your head unit to your car from potential theft is always a challenge. Ask a local head unit dealer for more information. Q: What are some of the most popular digital or internet-based radio apps you can use for your phone? Spotify is both a music library and streaming app and a radio app. Similar apps to Spotify include Deezer, where you can just pay a monthly price to skip the ads, turn off the shuffle and skip through tracks unlimitedly. Spotify is a great choice for those who want an extensive library to search for music. SiriusXM is the first thing that may come to your mind when you refer to “satellite radio”, as it is supposed to be a super enhanced, high quality and customizable version of your local AM and frequency modulation radio. If you like to go through road trips and don’t want your favorite radio station, sports news or radio talk show to go out of frequency, SiriusXM is a must-have with you on a long vacation. Pandora is another popular radio app, especially in the US and around the world. It is another music on demand service but focuses more on station creation from the users. It works pretty much like Spotify but many other users prefer Pandora at some point. iHeartRadio is another top contender when it comes down to radio apps, because of the variety of custom playlists, support for Chromecast, integration with Android Wear and on-demand music (with subscription monthly), working much like Spotify. AccuRadio is something you’d want to hit if you don’t want to be bothered with a monthly charge. AccuRadio might not be that stable yet with its servers, hence it is free, but you get a decent amount of 1,000 radio channels to choose from. Google Play Music is actually the Android counterpart to iTunes, but it does have a radio-like service with the monthly subscription, if you’re up to it. Radio Online charges you yearly rather than monthly, since it doesn’t have a lot of features as compared to our above-mentioned apps. It does, however, have a couple of internet radio stations, live radio recording, a sleep timer and many more. TuneIn Radio is more like SiriusXM that it doesn’t just focus on music, but also on various media like news, radio talk shows, comedy and the like. You can also listen to sports updates and the like with this app. XiliaLive Internet Radio is much like AccuRadio that it is for free and not that popular. It does, however, have over 50,000 live radio stations and most of the basic things you will find on any radio app or service. This depends on where you live, if your local radio station has a dedicated app for it, for you to be able to listen to their radio station in higher quality through the power of the internet. Q: What are the different terms about car stereos that people can get confused on? Car radio refers to tuners and receivers, which are part of the whole setup. It is any car radio setup in any vehicle. Car stereo refers to the combination of the head unit and the audio or music system, such as the speakers, in general. The head unit is the unit that sits on a vehicle’s dashboard. Receivers are head units that come with their own amplifier, so that you do not have to look for one. Tuners are head units that do not have an amplifier, so they are mostly found on systems that are old. A controller does not have a tuner, but it is also a head unit type. If your head unit does not have a cassette player, CD or DVD drive, then it is considered a mechless unit. The equalizer is the part of any head unit that allows you to customize the sound, to bring out trebles (high frequencies), bass (low frequencies) or vocals (mid frequencies). Speakers allow you to hear whatever is on the car radio system. The crossover is the part of the head unit that directs the audio or music signal to the speakers better. Q: What’s the difference between local and satellite radio? Satellite radio is only mostly popular in developed countries like the United States and Europe. Local radio is popular everywhere in the world. Satellite radio often comes as a subscription package with a monthly charge (like your cable TV or Netflix). Local radio is usually free, provided you have a decent radio with a working tuner. Satellite radio offers unprecedented sound quality, hence it is preferred by audiophiles. Local radio is usually lacking in the audio or music quality department, since it’s free, and also because of interferences and noise. Satellite radio is more than just for listening to music at home or at work – it is prized for being an on-the-go radio system that can be used in long distance travelling anywhere without ruining the quality or changing the programs. Local radio changes depending on the area you end up in, making it inconvenient when you’re listening to a station but it changes once you enter another area of your country or state. Satellite radio requires some pretty complex setup, since you will need a satellite radio module. Local radio is very simple – as long as you have a radio with a tuner, you can play it anytime, anywhere. Q: What are the uses of Bluetooth technology for your Android phone? 1. Bluetooth technology can be used for listening to music with headphones. 2. There are some mice and keyboards can be used with Bluetooth technology. 3. Most file transfers between phones are done by Bluetooth technology. 4. Creating Wi-Fi hotspots can also make use of Bluetooth technology. 5. Connecting to car stereos that are capable of Bluetooth technology can also be done by phones. A: A2DP is a kind of profile for Bluetooth technology, also called the Advanced Audio or music Distribution Profile. It helps to enhance the connection of Bluetooth technology from one device or phone to another, especially when making calls or streaming music. Q: What are the benefits of hands-free calling? Going hands-free means that you can call without taking one hand off the steering wheel and worrying about the handset and pressing buttons while driving through traffic. In addition to calls, you can also skip to the next song with the use of the hands-free technology in your music library. People with an iPhone or iPad can easily command Siri with the use of the hands-free integration. Many navigation systems today are going hands-free, which is very important for driving. Some hands-free systems allow text to speech and vice versa. Q: What are the differences between analog and digital or internet-based radio? Analog or traditional radio has a continuous signal. Digital or internet-based radio may be interrupted in some way. Analog or traditional radio tends to have more interference and loss of quality due to the noise. Digital or internet-based radios tend to have better signal because they are sent through the internet. Analog or traditional radios cannot be customized. Digital or internet-based radios can be customized. Q: What are the dangers of texting/calling while driving? 1. A split-second distraction can lead to an accident. 2. It will also potentially distract your vision. Q: Which countries have very strict laws with distracted driving? Q: Can listening to music negatively affect drivers? A: Yes, according to some studies, listening to music can potentially negatively affect your driving, because your brain is tied to the music and may be distracted when it comes down to keen senses and focus, since driving is all about logic and not just brute strength. Music is only ideal for activities that don’t require you to think too much. While it’s okay for long hours of traffic, it may not be the best when trying to avoid accidents. Q: What are the benefits of digital or internet-based radio? 1. Digital or internet-based radio has a lot of channels to choose from. 2. Usually, more songs are available on digital or internet-based radio. 3. You can pause and play on demand on most digital or internet-based radio sites. 4. You can search station names instead of the frequency. 5. Additional information about artists such as concert dates also appear. Q: What exactly is bitrate and how does it affect audio or music streaming? - The lowest possible bitrate you’ll probably encounter is 60 kbps, which sounds muffled like an old vinyl. - The standard for internet is 128 kbps, which sounds pretty normal and you can’t distinguish it. - The higher bitrate is around 192 kbps, by which most likely, Windows Media Player rips to. - The highest bit rates are from 320 to 400+ kbps, which is suitable for high quality listening. Q: What are the different common file formats that can be recognized by most music players? 1. MP3 – commonly used format, in which the highest quality is up to 320 kbps. It is also a universal format that can be used anywhere. MP3s come in various bitrates, from 60 kbps up to 320 kbps, and the normal bitrate is from 128 kbps up to 192 kbps. MP3s are encoded in the easiest way, but can be compressed in terms of audio quality, to reduce the file size. 2. AAC – it is a higher quality than MP3 but with less compatibility with some devices. It is much like the MP3 in terms of encoding, but the catch is that AAC tends to be of higher quality in audio format. 3. WMA – standing for Windows Media Audio or music, WMA files can be played by some music players, but not all of them, unlike mp3. WMA gives you an almost CD quality with a super low file size. By default, a Windows Media Player that is an old version will most likely rip your CD into WMA instead of mp3 formats like the newer versions today. 4. FLAC – FLAC is the highest quality audio or music format possible due to its large file size and lossless quality, and is preferred by audio or music enthusiasts and experts. FLAC lets you listen to pure CD quality because of its size. It is also good for sound engineers who want to listen to a full mix. Q: What is an AUX port and what are the different devices that use it? A: The AUX port or the auxiliary port is the port that is used for mp3 players, speakers, amplifiers, portable music players and headphones. It is also called the audio or music jack and you can listen to music with this kind of port. It is commonly found on many kinds of devices that allow you to listen to music. 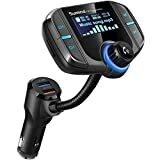 In the long run, we conclude that the Nulaxy Wireless In-Car is our pick for the best FM transmitter, due to the ease of charging devices because of the 5V-2.1A charging port that can allow charging on the go. It also has very minimal interference and background noise so your focus is on the music and not your car’s noise or the wind outside.